923 What's our government's debt? 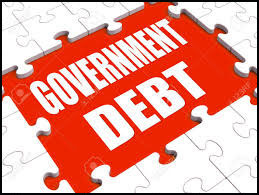 The issue of government debt surely is a puzzle … government debt (also known as public interest, public debt, national debt and sovereign debt) is the debt owed by a government. By contrast, the annual "government deficit" refers to the difference between government receipts and spending in a single year. Australia's net government debt as percentage of GDP in the 2016–17 budget was estimated at 18.9% ($326.0 billion). The budget forecasted that net government debt would increase to $346.8 billion in 2017–18 and $356.4 billion in 2018–19. The budget shows $16.4 billion will be paid in interest to service liabilities for the year to June 2018. This is approx. $1.3 billion per month, or $44 million per day. Wow! As of March 2017, the U.S. debt is about $19.9 trillion; it amounts to: $61,365 for every person living in the U.S. The figure for AUS ist $13,075 p/p. So why do countries have to issue debt at all? Debt is an extremely cheap and therefore attractive form of financing for governments … they're able to borrow at incredibly low interest rates, invest in infrastructure, and produce a positive return on investment from that debt. A person can have both debts and investments at the same time. For instance, many people have their home mortgages while at the same time investing in the stock market. Corporations do the same and same for governments. The key here is to stay float (keep debts below assets). What is important here is not the "External Debt" statistic, but the Net international investment position (NIIP) that measures a country's investments minus debts. 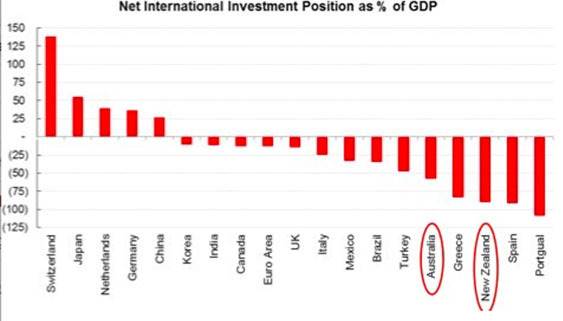 As you can see, some countries have a large investment while other countries have a large debt. By that measure Australia's position is not all that good after all.